Designed by the Peugeot design studio to complement the original vehicle styling, the 1007 rear spoiler adds that extra sporting touch. 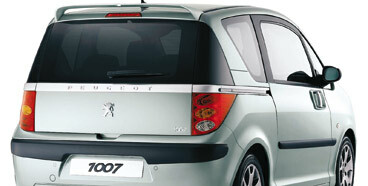 Product Description: Designed by the Peugeot design studio to complement the original vehicle styling, the 1007 rear spoiler adds that extra sporting touch. PEUGEOT 1007 ARMREST [Fits all 1007 models] 1.4 1.6 & HDI GENUINE PEUGEOT PART! PEUGEOT 1007 LONGITUDINAL ROOF RAILS [Fits all 1007 models] 1.4 1.6 & HDI NEW! PEUGEOT 1007 EXHAUST EMBELLISHER [Fits all 1007 models] 1.4 1.6 & HDI NEW! PEUGEOT 1007 EVEANYS 16" ALLOY WHEEL [Fits all 1007 models] 1.4 1.6 & HDI NEW!